There are plenty of ways to kill someone, a fact that Agent 47 of the Hitman video game series knows all too well. Click here to play! 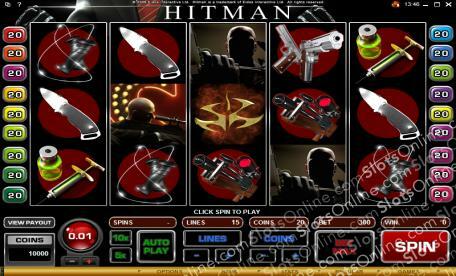 In the Hitman slots, players are introduced to many of Agent 47's favorite methods of eliminating his targets, and they get to share in the spoils of his illicit trade to boot. Some of the methods of killing featured in the Hitman slots include: a concealable knife, duel pistols, a garrote, sniping, and intravenously administered poison. A feature shared among most of these weapons is that they are stealthy, duel pistols being the exception. While most of a hitman's work is done from the shadows, you never know when things are going to go wrong and opening fire with akimbo pistols will get you out of a tough situation. In the Hitman slots, you can convert contracts on criminals and terrorists into cold hard cash. Choose the right tools for the job, keep your guns in their holsters if you can, and prepare to make a fortune as gunman for hire Agent 47 in the Hitman slots. Rated 18 symbols are scatter symbols that award 18 free spins with a double multiplier on wins when more than 3 land on the reels. The Insignia symbols are also scatter symbols, but they trigger a bonus when they land on reels 1, 2 and 3. Also, the Bonus Netbook symbol triggers a bonus game when landing on reels 3, 4 and 5. The Agent 47 symbol is wild, expanding to fill every position on a reel that it lands on, in order to complete any possible wins. It substitutes for any symbol other than scatter symbols. There are two bonus games in this slots game. The first is triggered by Insignia symbols, in which you must choose one of the symbols to receive a bonus. In the second game, triggered by Bonus Netbook symbols, you are given a choice of contract hits to choose, each offering a different bonus.